More than a fourth of the 607,380 bridges in the US are over 50 years old, and 108,000 of the bridges are constructed with pre-stressed concrete. All bridges are supposed to be inspected every 2 years but even when inspections are done, it is still the archaic visual inspection or listening to the change of tone by hitting the cable with a hammer. These outdated methods lead to subjective, often inaccurate conclusions. Critical clues are missed and lives are at risk. New York, NY, March 27, 2018 --(PR.com)-- A nation’s infrastructure is too precious and too enmeshed with human lives, to leave decision-making to guessing or subjective interpretation. Data is a crucial factor in deciding what is wrong with a piece of infrastructure, especially the aging bridges of the United States. Bridges are mostly connected with post tensioning, a technique developed in the 1930s to reinforce concrete. In 1933, a young French civil servant, Eugene Freyssinet, produced three large pre-stressed concrete girders and inserted them underneath the quay in LeHavre, in France, to prevent its collapse. Over the years, civil engineers began using post-tensioned cables for safety of large concrete structures. Millions of miles of such cables, embedded in grout and enclosed and sealed in rubberized exteriors, known as post-tensioned tendons, support and hold up hundreds of thousands of bridges and highways in the US. They enable larger spans, thinner slabs and greater distances between support columns of bridges. The concrete floors of parking garages, apartment buildings and condo's are reinforced in the same manner. This allow for longer and thinner slabs of concrete to be used. In the building of complex bridges, post-tensioned tendons are filled with grout to prevent corrosion. Low quality grout and admixtures and improper grouting procedures, ageing and weather conditions could, subsequently, lead to separation of grout within the tendon. The grouting creates a high alkaline environment to prevent corrosion, but grout separation, water and air intrusion creates oxidation leading to corrosion and loss of metallic area and tendon failure. It is a fact that corrosion of post-tensioned tendons in complex bridges have become a significant problem in recent times. In 2016, a report by the Florida Department of Transportation refers to “severe corrosion” of post-tensioned tendons in the Ringling Causeway Bridge in Sarasota, Florida. The report explains the corrosion with reference to separation of grout and the high moisture content in the immediate environment. However, the bridge was built in 2003. The question arises why the corrosion went unnoticed for 13 years, and was only being looked at when the condition had considerably worsened. Back in 1998, the US Federal Highway Administration, (FHWA), estimated the annual cost of corrosion on highway bridges as $8.3 billion. The worldwide corrosion authority, NACE International, headquartered in Houston, Texas, estimates the current annual direct cost of corrosion on highway bridges as $13.6 billion. More than a fourth of the 607,380 bridges in the US are over 50 years old, and 108,000 of the bridges are constructed with pre-stressed concrete. All bridges are supposed to be inspected every 2 years, but that does not happen consistently. Even when inspections are done, it is still the archaic visual method producing subjective results. These outdated methods can lead to inaccurate conclusions. Critical clues are missed through human error. It is imperative for the DOT to adopt modern technology into the inspection process. The technology exists today to go way beyond subjective testing says Doug Thaler of "IPC" Infrastructure Preservation Corporation, Technology along with the inspector can conduct these inspections more efficiently with fewer lane closures and at a price consistent with the manual inspections being done today. 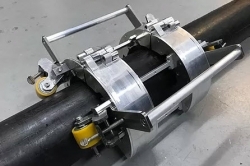 Following six years of R&D, IPC has launched TendonScan® to its service range, able to scan the inside of the tendon and locate vulnerability to corrosion by analyzing air, water and bleeding grout within the tendon as well as locating loss of metallic area. Using the latest Non-Destructive Evaluation (NDE) and Non-Destructive Testing (NDT) technologies, TendonScan® is able to track the size and shape of the developing abnormality, and guide timely and necessary repairs with razor-sharp accuracy. Locating developing issues before they become problems, and paving the way for early repairs to extend the lifecycle of tendons and save millions of taxpayer dollars. TendonScan® is able provide baseline condition assessment for both preventative maintenance or to locate existing section loss in the steel, and, has surpassed all available technology to inspect post-tensioned tendons in bridges before they become a danger to the traveling public. Rust build up in construction, especially steel concrete bridges, is notoriously stealthy. Furthermore, bridges have to endure so much – vagaries of the weather like icy winters and blistering summers, heavy traffic and emissions and steel-unfriendly ice-melting salts. All of these conditions contribute to rusting of bridges. If ignored, rust can lead to deadly consequences like total collapse of bridges. Why would engineering firms and the department of transportation wait until the last straw piles up on the camel’s back? What is holding them back from embracing new technology? American investor James O’Shaughnessy said, “By relying on the statistical information rather than a gut feeling, you allow the data to lead you to be in the right place at the right time.” It is just the asset owners or their representatives desire to step beyond convention and utilize these existing technologies to update those 50 year old manual methods to keep the public safe.